Blackboard Chalkboard by Ollie Stone: Sussex based pub sign writer for hire. Chalkboards, blackboards and signage. Sussex based pub sign writer for hire. Chalkboards, blackboards and signage. 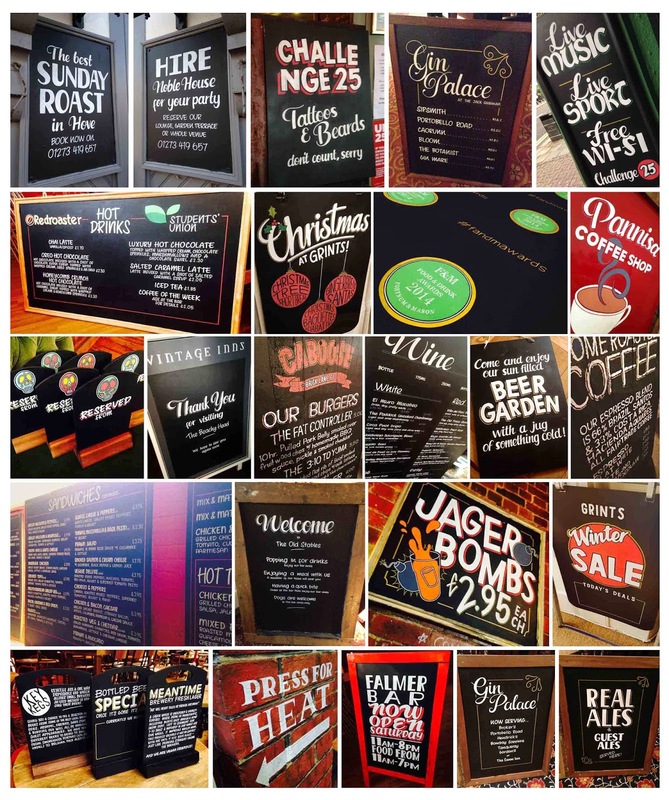 Freelance, bespoke chalkboard and blackboard sign writing right here! My name is Ollie Stone and I've worked with some of the biggest pub chains around, delivering unique, custom made signage right across Brighton, London and the South East. My clients include JD Wetherspoon, Vintage Inns, Marstons and a whole host of independent businesses in need of that special something to promote themselves. So whether you're in need of a giant a-board to bring in the customers or some hand-crafted signage to display your latest offers and events, give me a ring. I'm competitive with my pricing, willing to travel to you and have a vast collection of paint with which to create the perfect imagery to suit your business.